In the 1960s, the skies above the United States were patrolled by agents of the apocalypse. Air Force B-52 Stratofortresses circled the North American continent, 24 hours a day, cradling two megabombs in their bellies. 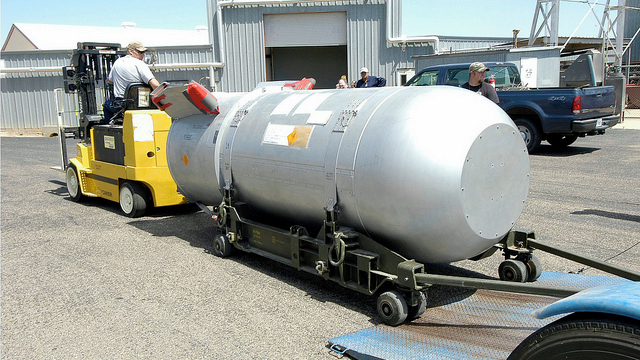 Those B-53 bombs each weighed 4500kg. Were one to drop on the White House, a nine-megaton yield would destroy all life out into suburban Maryland and Virginia. It was the ultimate Cold War weapon, the one that Major Kong would have rode into Armageddon at the end of Dr Strangelove. And on Tuesday, it will no longer exist. Out at the Energy Department's Pantex Plant near Amarillo, Texas, the last of America's B-53s is in storage. Come Tuesday, it will be dissected: the 136kg of high explosives will be separated from its enriched uranium heart, known as a "pit". The pit will be placed into a storage locker at Pantex, where it will await a final, highly supervised termination. First brought into the US nuclear stockpile in 1962, the B-53 was so big because it was so dumb. With poor precision mechanisms for finding a target — "Its accuracy was horrendous," Kristensen says — what it lacked in smarts it made up in strength. The nukes that vaporised Hiroshima were a mere 12 kilotons; the B53 provided nine megatons — 9000 kilotons — of destructive power. And it was designed to burrow deep. The B53 wasn't just any old megabomb. It was the first bunker buster. US nuclear doctrine called for it to be delivered over suspected underground Soviet command-and-control facilities. The dumb bomb wouldn't destroy them so much as it would destroy everything remotely near it, leaving — literally — a smouldering crater. That was the US plan for "victory" in a nuclear war right up until the implosion of the Soviet Empire. At its height, the US had 400 of the mega-gravity bombs. But it was decommissioned in 1997, so it's not as if the US suddenly finds itself without its massive gravity bomb. It's been a slow process of destruction ever since, although Pantex spokesman Greg Cunningham says that he can't say how long it takes to destroy one of the bombs. The America's nuclear arsenal remains enormous; the US will still have 1500 atomic weapons, by the time the latest US-Russia nuke treaty runs its course. But with the end of the B-53 comes a belated end to a Cold War relic.